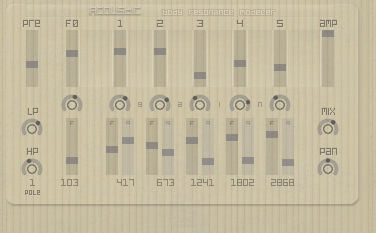 Acoustic by xoxos is a Virtual Effect Audio Plugin. It functions as a VST Plugin. Acoustic is a simple acoustic body resonator model, consisting of a first order mass-spring for modeling the Helmholtz or 'air' frequency, and a banded waveguide.